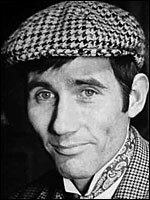 Born in Rothwell, Northamptonshire, on 15 August 1935, Jim Dale trained for ballet before debut as a stage comedian in 1951, and also enjoyed some success as a pop singer. Wonderfully droll on stage in such diverse plays as The National Health and The Merchant of Venice (both Old Vic, 1970), tall, cheerful Dale has never quite had roles that give him enough scope on screen. He appeared in eleven ' Carry On ' capers, but, funny as he is there, he is almost too subtle to make his presence felt among all those bold farceurs, though he is the only pleasure on hand in the series' finale, Carry On Columbus (d. Gerald Thomas, 1992), in the title role. His best screen chances in Britain were probably in the little-seen adaptation of The National Health (d. Jack Gold, 1973) and as Spike Milligan in Adolf Hitler - My Part in His Downfall (d. Norman Cohen, 1972). He became popular in such Disney films as Pete's Dragon (US, d. Don Chaffey, 1977), won a Tony for the title role in Barnum on Broadway, and wrote the Oscar-nominated lyrics for the title song for Georgy Girl (d. Silvio Narizzano, 1966).